From 5 to 8 december 2013 was held in Vienna at Ragnarhof the leading world-wide festival concerned with cocktail robotics, Roboexotica, co-produced since 1999 by two Vienna-based art collectives, Shifz and monochrom, and supported by the "Bureau für Philosophie" (Department of Philosophy, University of Vienna). 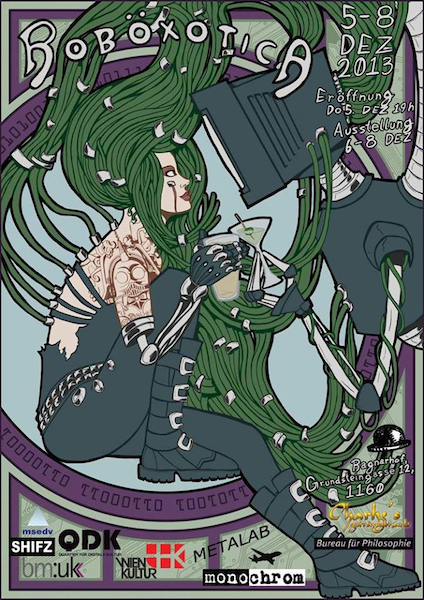 The annual international festival consists of an exhibition, a conference, social events, and the ACRA (Annual Cocktail Robot Awards). 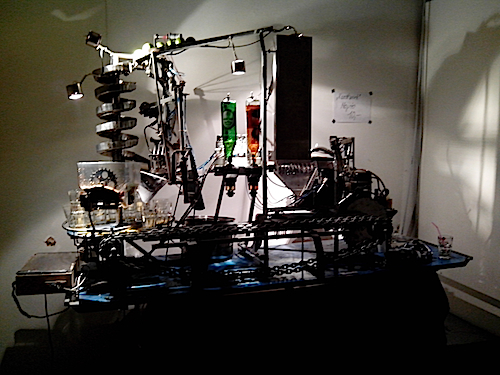 During these three days, almost twenty cocktail robots were displayed and their cocktails tasted by the audience. Some of these robots have been in development for many years and were already displayed the previous years. But their constant improvements give their presence essential. This year, interactivity between drinkers or via different web interface such as Twitter, Facebook or the Bitcoin payment apply. - melmacc (Mysterious Electrical Machine for Automated Cocktail Creation), by Oliver Höftberger, Robert Neuner, Michael Müller, which with its clean and wooden aspect is as efficient than discreet. 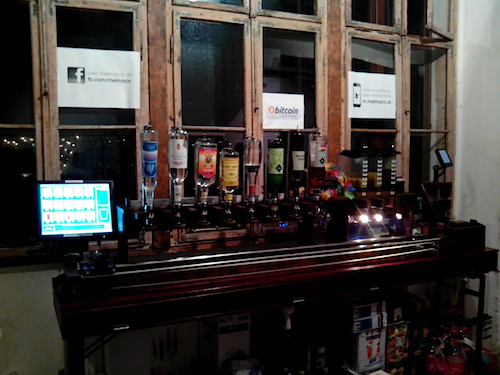 Its latest additions, a robot arm that adds a straw with a labelled sticker to stir the drink and a mobile web interface for ordering from a smartphone, are a must. - Robomoji, by Robert Martin, merges industry and robotics. 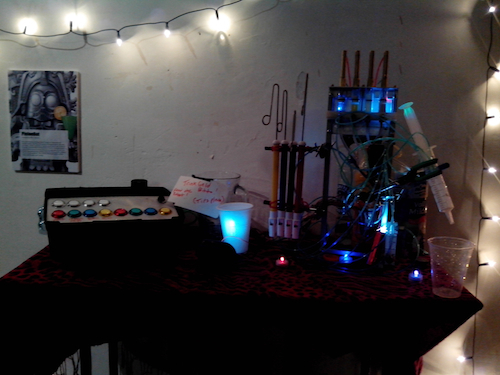 With its metallic aspect, its cogwheels, its chain transmission and its sound, Robomoji is a veritable cocktail factory. 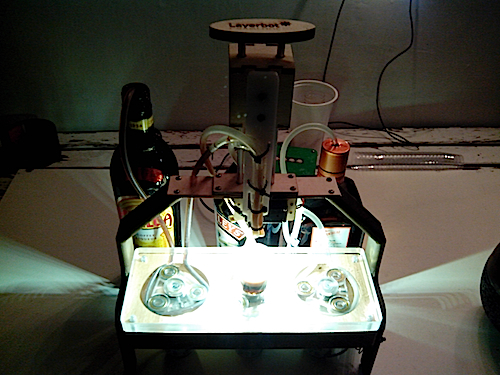 - LayerBot, by Bernhard Kubicek, which did a really esquisite cocktail. - PistonBot, by Rich Gibson, which makes strange noises while dispensing your booze, giving us the impression to be Roy Neary, playing music to bots this time. In this dark and smoky atmosphere, the different tastes reminded us the famous pianocktail imagined by French writter Boris Vian in "L'Écume des jours" ("The Foam of the Daze"); itself derivated from the mouth organ imagined by J.K. Huysmans in "A Rebours" ("Againt the Grain"). Pianocktail which is now often built and even available. Finally, what would have been these days without visiting the exhibition Roboter: maschine und Mensh at the Technisches Museum Wien where we discovered the House bar in the shape of a globe by Nicolas Lanz conceived in the 1960s ?